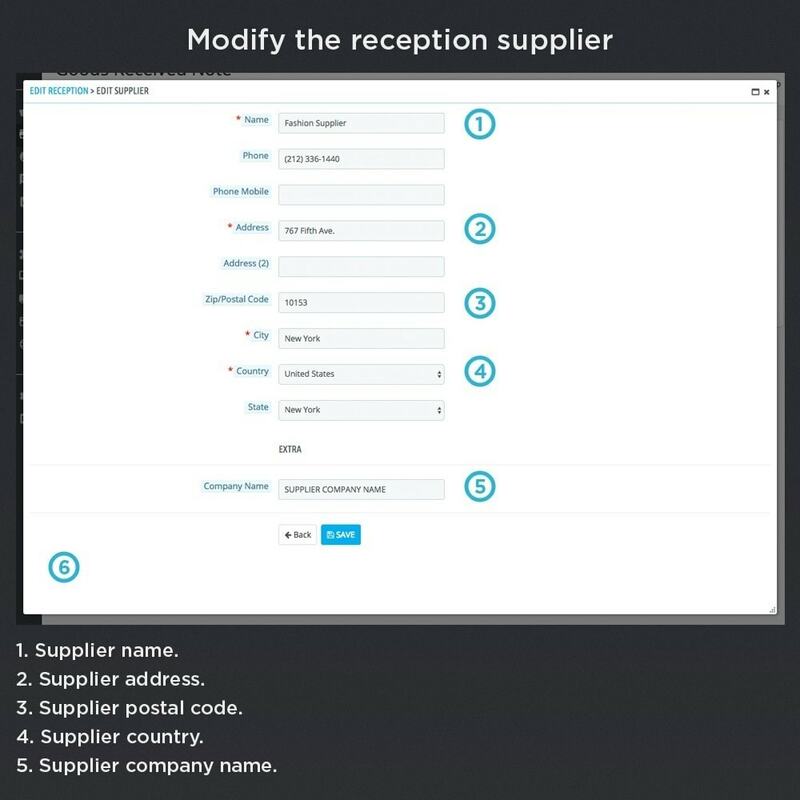 This module allows you to manage the products received from suppliers. 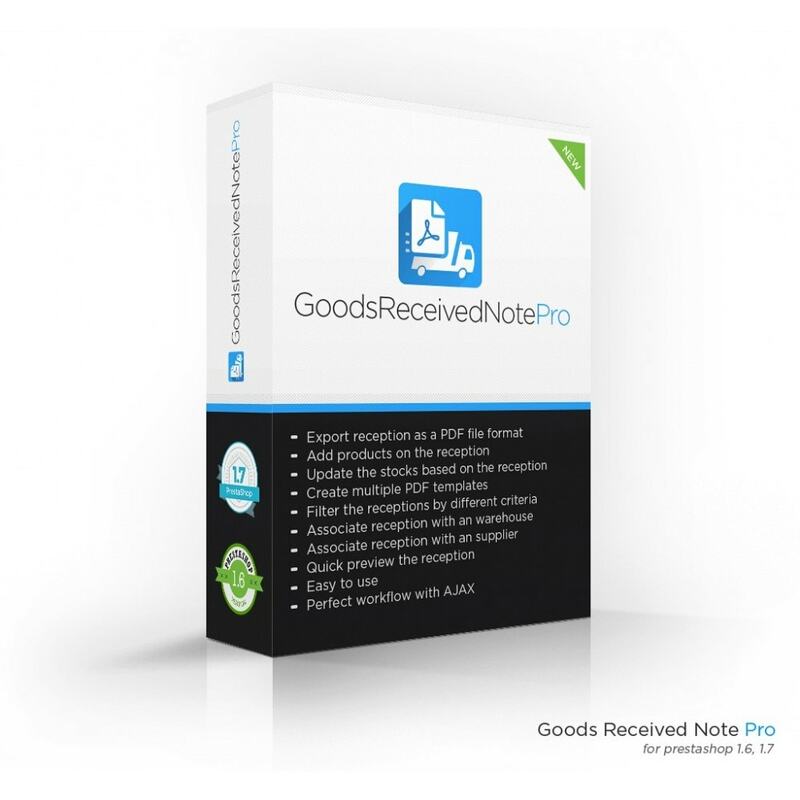 Export the reception note to a PDF file format and update received products stocks automatically. 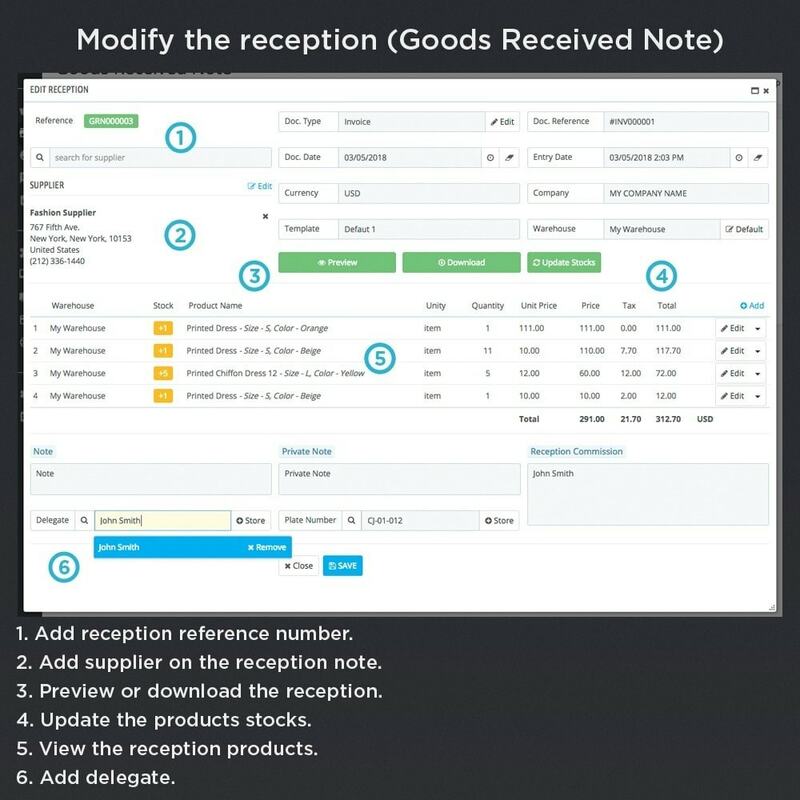 Create multiple goods received note with the products received from the supplier. Export the reception note into a PDF file format. 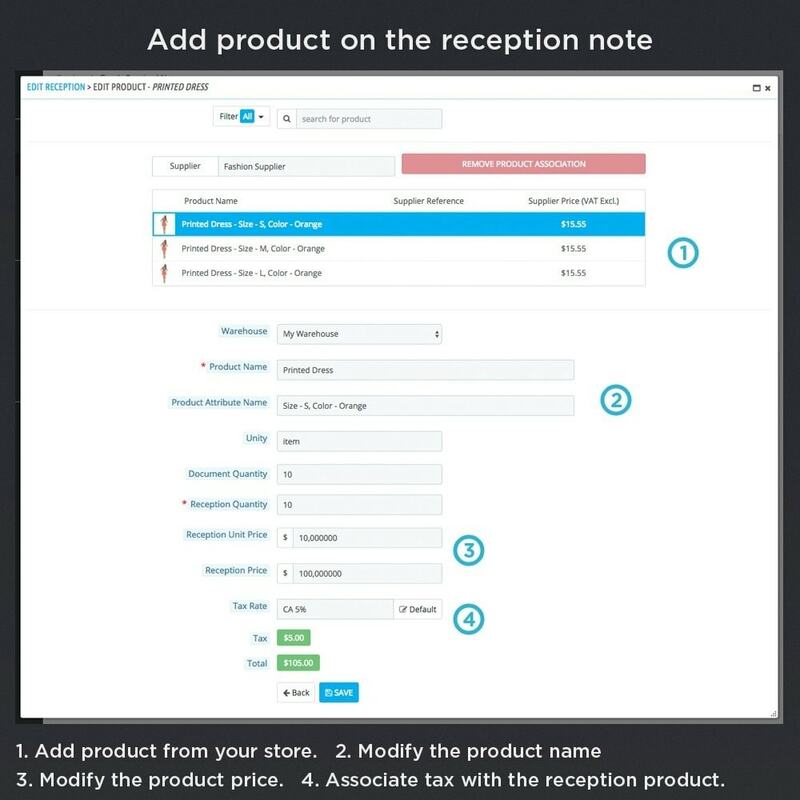 Add products on the reception note. Update the products stocks automatically after you added them on the reception note. 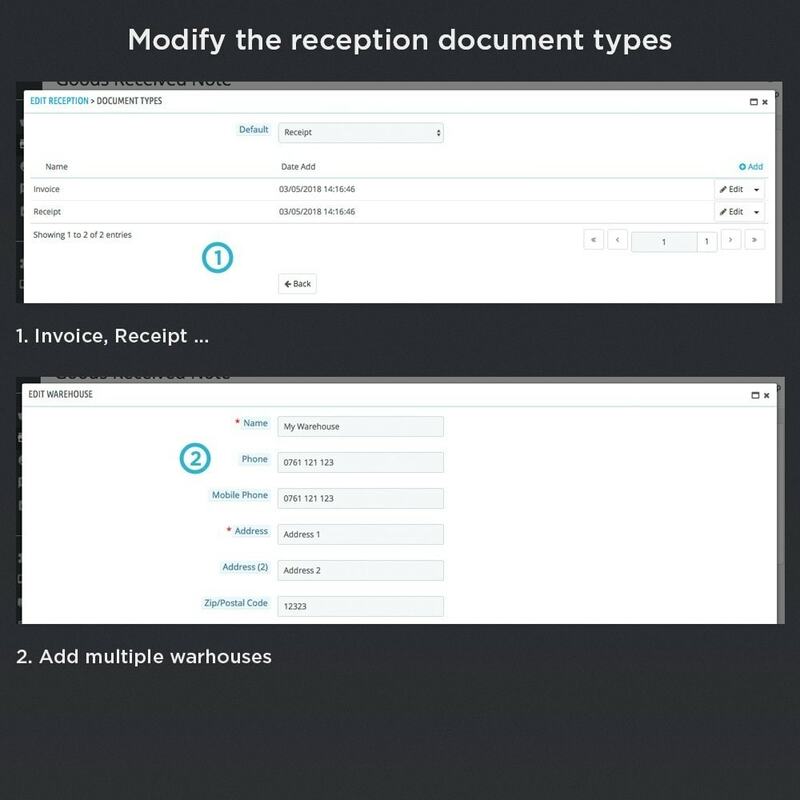 Create multiple goods received note, and export them as a PDF file format. Add / Edit the reception. Assign document type on the reception. For example Invoice, Receipt, etc.. 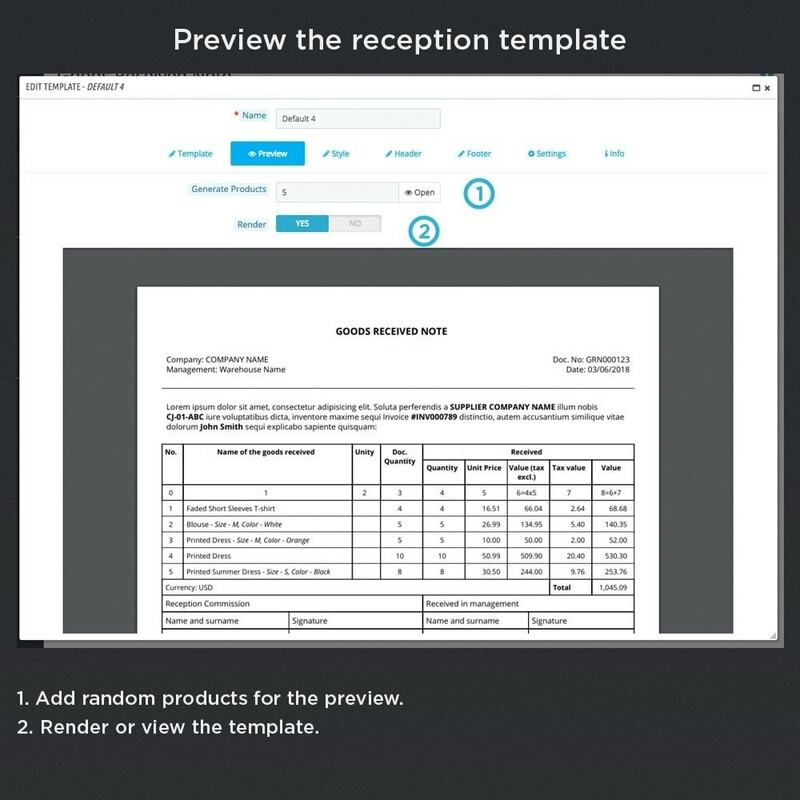 Assign document reference on the reception. Associate a supplier with the reception. Setup the reception entry date. Setup the reception company name. 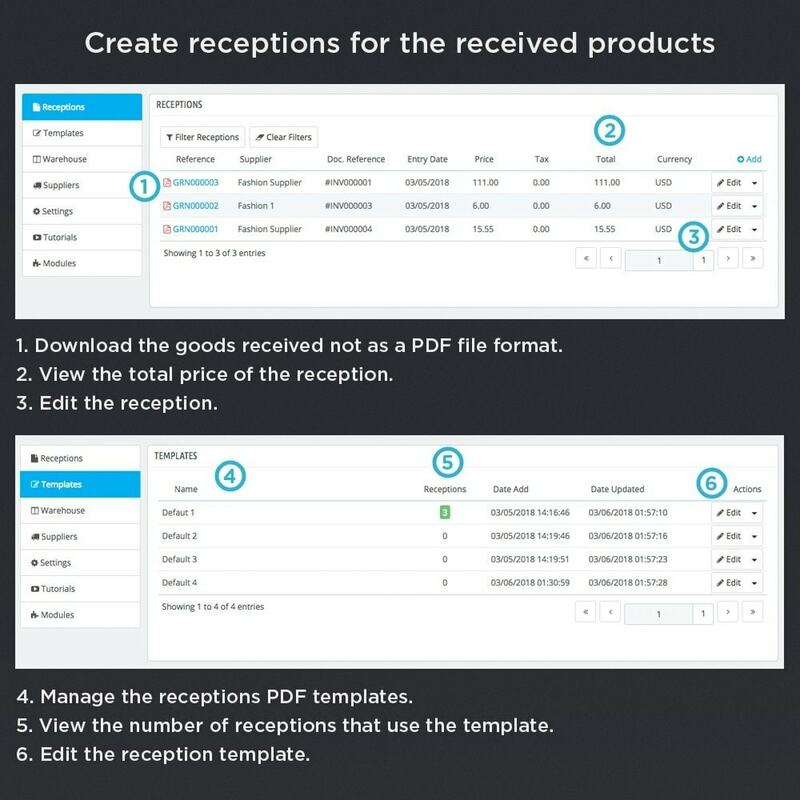 Choose a reception template to export it as a PDF file format. Preview / Download the reception as a PDF file format. Update the receptions products stocks. Add / Edit products on the reception. Associate tax rate with the reception products. Add / Edit the template. 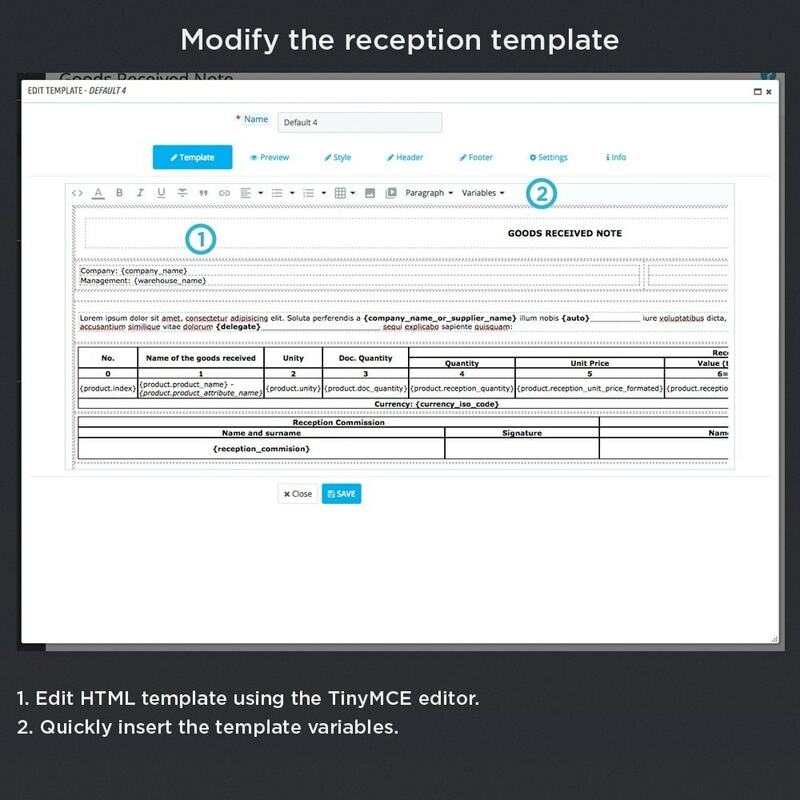 Modify the template using the TinyMCE editor. 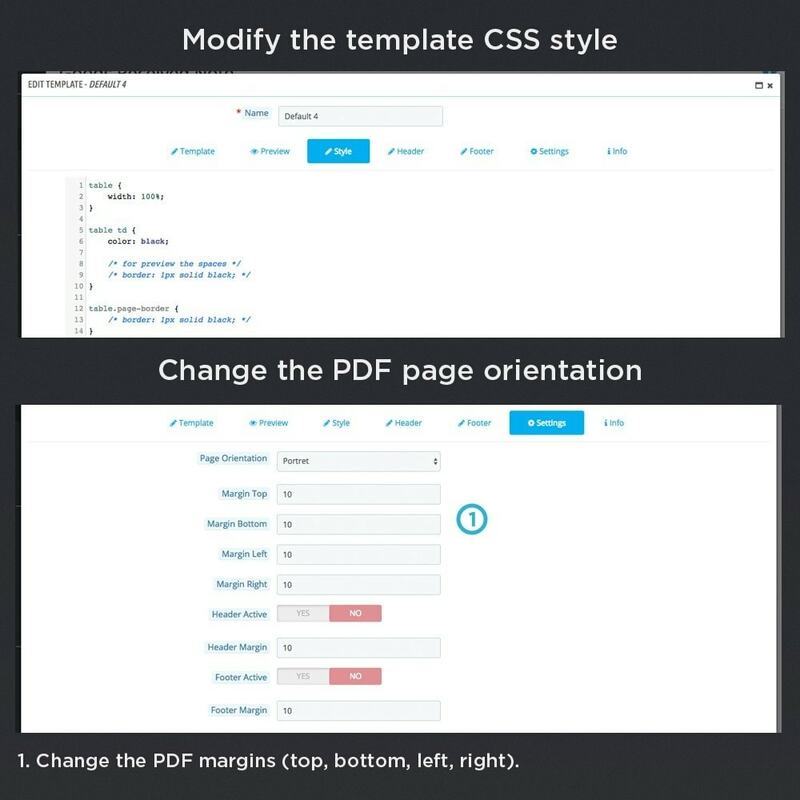 Style the template using the CSS stylesheet. Add a header and a footer on the PDF file. Setup the PDF page orientation (Portrait or Landscape). Setup PDF margins (top, bottom, left, right). 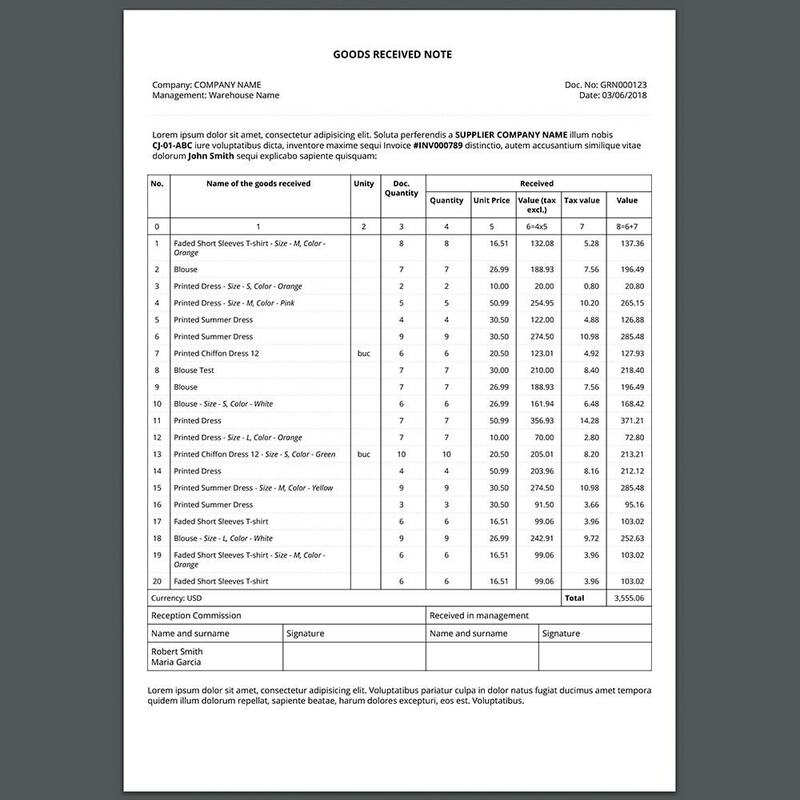 There are 112 available variables for the PDF template. 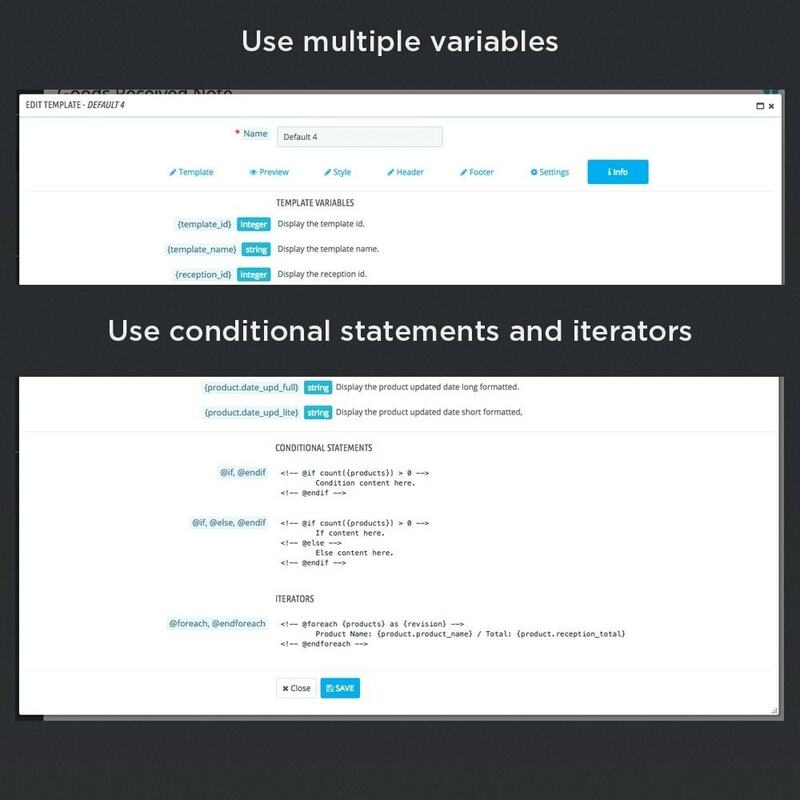 Use conditional statements into the template. Use foreach loop into the template. Add / Edit the warehouse. Setup the warehouse phone number. Setup the warehouse zip/postal code. Setup the warehouse city, country and state. Add the company name for each supplier on the store, that can be used on the goods received note.